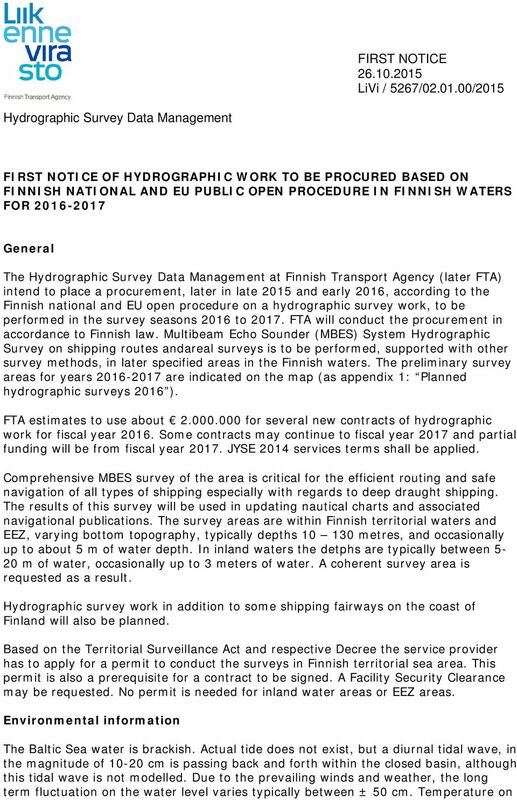 Download "FIRST NOTICE OF HYDROGRAPHIC WORK TO BE PROCURED BASED ON FINNISH NATIONAL AND EU PUBLIC OPEN PROCEDURE IN FINNISH WATERS FOR"
4 surveys, data editing and processing, and project management shall be presented; i. 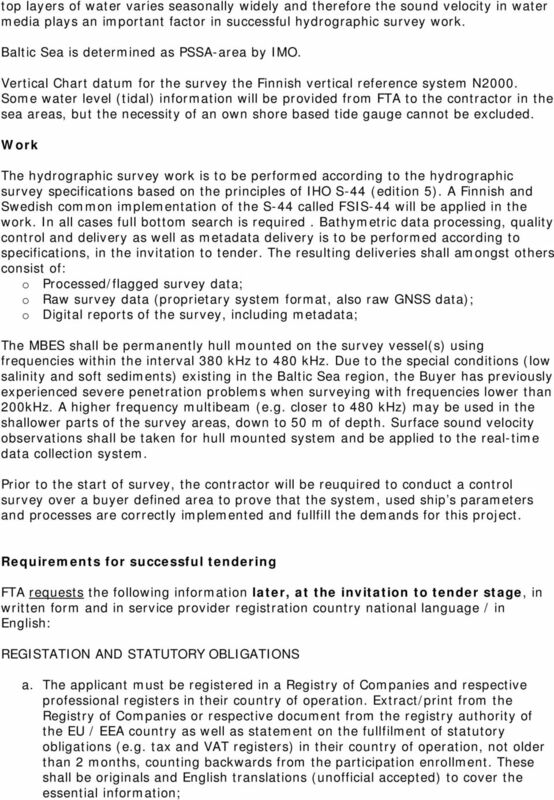 The Applicant shall have experience in performing extensive water level (tidal) comparisons, including long time levelling of the tidal stations, for the survey area. Reference shall be given; j. 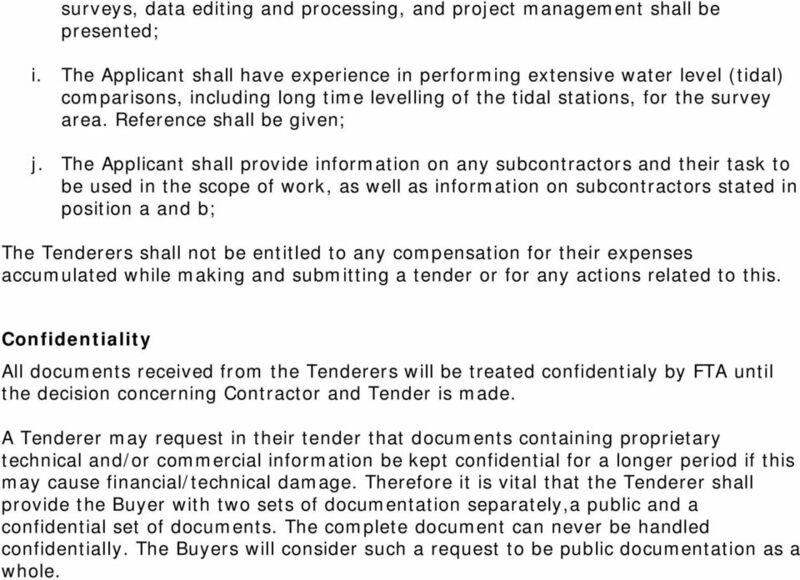 The Applicant shall provide information on any subcontractors and their task to be used in the scope of work, as well as information on subcontractors stated in position a and b; The Tenderers shall not be entitled to any compensation for their expenses accumulated while making and submitting a tender or for any actions related to this. Confidentiality All documents received from the Tenderers will be treated confidentialy by FTA until the decision concerning Contractor and Tender is made. A Tenderer may request in their tender that documents containing proprietary technical and/or commercial information be kept confidential for a longer period if this may cause financial/technical damage. Therefore it is vital that the Tenderer shall provide the Buyer with two sets of documentation separately,a public and a confidential set of documents. The complete document can never be handled confidentially. The Buyers will consider such a request to be public documentation as a whole. 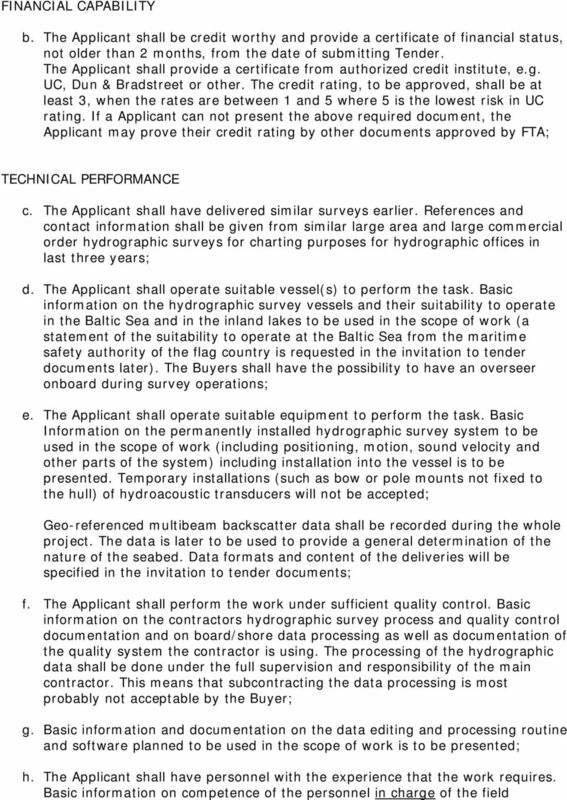 Hydrographic Survey Cost Comparison Methods and Procedures May 11, 2005 In 2001, NOAA s Office of Coast Survey (OCS) undertook a study to obtain overall cost estimates for acquiring hydrographic data. 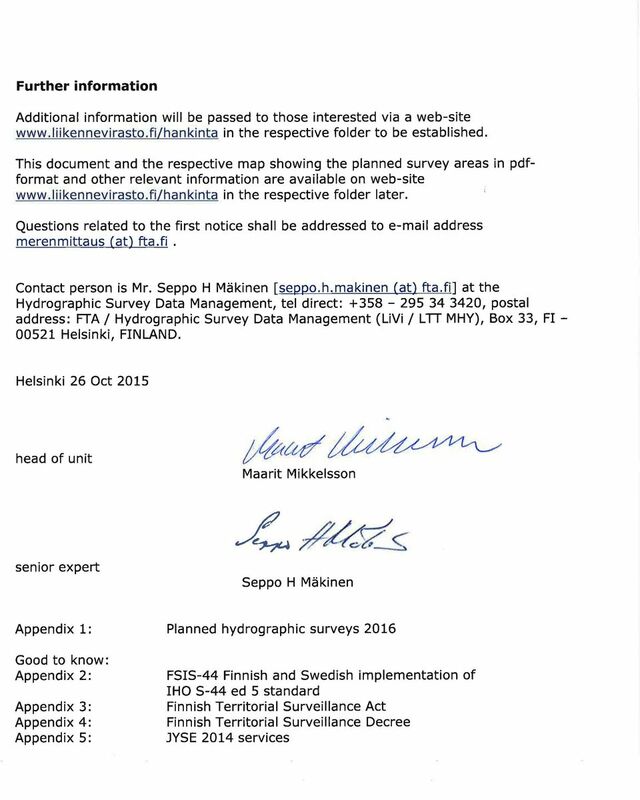 Overview of Submarine Cable Route Planning & Cable Route Survey Activities. Graham Evans Director EGS Survey Group www.egssurvey. KAPITTEL CHAPTER 9 4 PHYSICAL CONDITIONS OFF THE COAST OF NORTHERN NORWAY Bjørn Ådlandsvik, Marek Ostrowski and Jofrid Skarðhamar Processes on the seabed are determined by physical conditions in the ocean. Offshore competence transfer from O&G to wind - perspectives and challenges. Kongsberg Maritime. RenewableUK 2011 Manchester Oct. Relevant working methods, models and processes for the assignment must be reported. Maritime and Coastguard Agency LogMARINE GUIDANCE NOTE. Navigation - Automatic Identification Systems (AIS) - Annual Testing.